Many partial differential equations (PDEs) that arise in physics can be viewed as infinite-dimensional Hamiltonian systems. 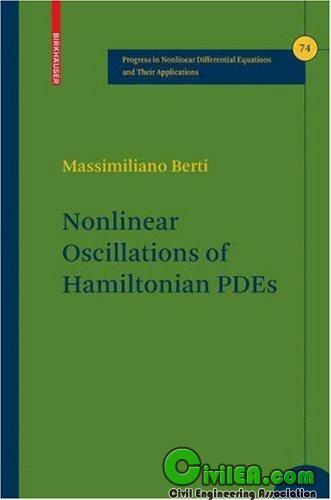 This monograph presents recent existence results of nonlinear oscillations of Hamiltonian PDEs, particularly of periodic solutions for completely resonant nonlinear wave equations. After introducing the reader to classical finite-dimensional dynamical system theory, including the Weinstein—Moser and Fadell—Rabinowitz bifurcation results, the analogous theory for nonlinear wave equations is developed. The theory and applications of the Nash—Moser theorem to a class of nonlinear wave equations is also discussed together with other basic notions of Hamiltonian PDEs and number theory. The main examples of Hamiltonian PDEs presented include: the nonlinear wave equation, the nonlinear Schrödinger equation, beam equations, and the Euler equations of hydrodynamics. This text serves as an introduction to research in this fascinating and rapidly growing field. Graduate students and researchers interested in variational techniques and nonlinear analysis applied to Hamiltonian PDEs will find inspiration in the book.